HomeFree cookies are delicious and healthy for everyone, and also make it easy to meet most special dietary needs. They all are kosher pareve for an easy any-time dessert. Additionally, they include people who need peanut and nut free, egg and dairy free, soy free, certified gluten free, vegan, low sodium, Non-GMO Project Verified, all natural or organic, and whole grain, and some are low glycemic. 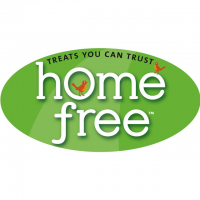 HomeFree is a certified woman owned business, and is a pioneer and leader in the industry with regard to allergy safety.